In late 2017, the WDM launched the Saskatchewan LGBTQ2+ History Collection with the goal of creating a permanent collection of objects that tell stories about LGBTQ2+ life in Saskatchewan. We are committed to preserving and sharing LGBTQ2+ history through this collection. The Saskatchewan LGBTQ2+ History Collection will be used for exhibits, research and education. The WDM believes that people’s lives are enriched by connecting with Saskatchewan’s diverse histories and that people gain a sense of place and belonging when their histories are shared through the Museum. With your help, we will support the collection, conservation and interpretation of the province’s LGBTQ2+ history. 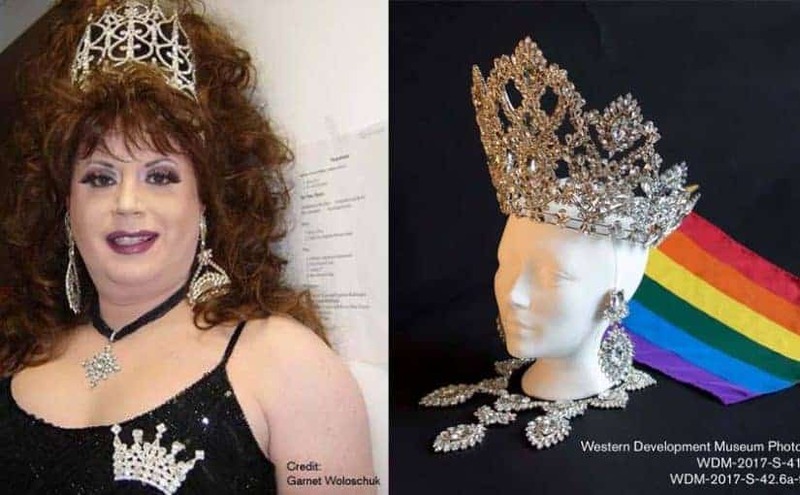 One of the first artifacts the WDM has collected related to LGBTQ2+ history in Saskatchewan is a crown and necklace set made by a Toronto Designer, Cyprian Ho of Designs by Cyprian. This set was commissioned by well-known Saskatchewan drag queen, Crystal Clear, for her final walk at Coronation 15 in Regina when she stepped down as Empress 14 of Regina and All of Saskatchewan. Her full title was Crystal Clear “The Evil Eyed Red Garnet Supreme Siren Sorceress of Frenzied Frivolity” Empress 14 of Regina and All of Saskatchewan. The crown was commissioned to be a full circular crown. According to the Imperial International Court System, only an empress can wear a full circular crown. The crown is eight inches high and the earrings are so heavy they had to be held on with fingernail glue. The necklace has three pieces that can be removed and worn as brooches. The set was all made by hand, commissioned in 2004 and first worn in 2005 in Regina. The first branch of the Imperial Court System in Saskatchewan was started in Saskatoon in 1989, but closed in 1993. Regina’s branch started in 1991 and is still active to this day. Lean more about the Saskatchewan LGBTQ2+ History Collection.